What does a Polysomnography sleep test do? When a patient feels that they have some sleeping problems or sleep disorders they may consult a doctor, health practitioner or specialist for diagnosis. To confirm an initial diagnosis the patient may be referred to a sleep clinic for a Polysomnogram sleep study or sleep test. 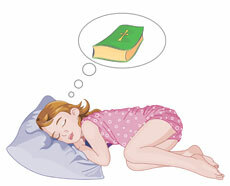 A sleep test is used as a diagnostic tool in sleep medicine. A Polysomnography (PSG) test is the most common multi-parametric test used in the study of sleep. The word Polysomnography is derived from the Greek word 'polus' for "many, much", the Latin word 'somnus' meaning "sleep" and the Greek word'graphein' meaning to write "to write". Approximately 50 - 70 million Americans are reportedly affected by Sleep Deprivation. A polysomnogram sleep study will typically record a minimum of 11 channels requiring a minimum of 22 wire attachments to the patient. Electrodes are attached to the chin, the scalp and the outer edge of the eyelids. Monitors attached to the chest record the heart rate and breathing. The results of the Polysomnography test are interpreted by the specialist doctor who writes a report which is sent to the referring physician. The results usually contain specific recommendations based on the test results. For example if Obstructive sleep apnea was evident then the use of a CPAP nasal breathing mask covering the nose and mouth might be recommended. What does a Polysomnography test do?